Water is Life” became the rallying cry of the water protectors trying to stop the Dakota Access Pipeline at Standing Rock, and now those words flow between St. Paul and Minneapolis via the Green Line train. Andrea Carlson’s colorful train-wrap design, which reads “Mni Wiconi” (water is life, in Dakota) on one side and “Nibi gaa-bimaaji’iwemagak” (the water that gives life, in Ojibwe) on the other, first hit the tracks on March 3, and will act as a central piece in this year’s Northern Spark Festival, which takes place along the transit line from dusk until dawn on the night of June 10. The art festival’s new route along the Green Line will highlight different communities in Minneapolis and St. Paul through partnerships with community organizations and nonprofits doing work around social justice and the environment. It’s all part of a two-year theme, begun in 2016, which emphasizes climate change and the ways communities can work together for a healthier Earth. 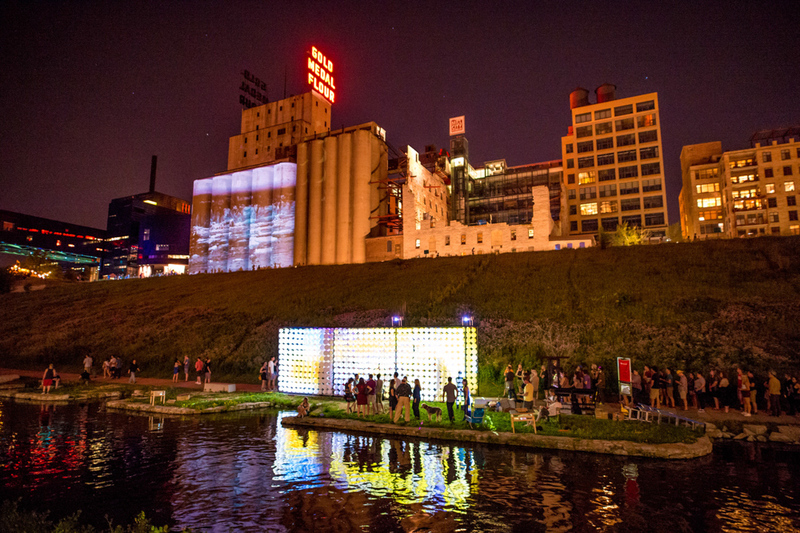 Since its first year in 2011, Northern Spark has often featured performances, installations, or projections that have touched on issues of water, energy, and the environment. 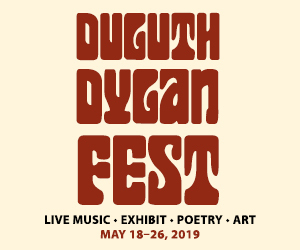 The festival has taken care about where it takes place, centering activities around bike paths and public transportation, as well as the Mississippi River. 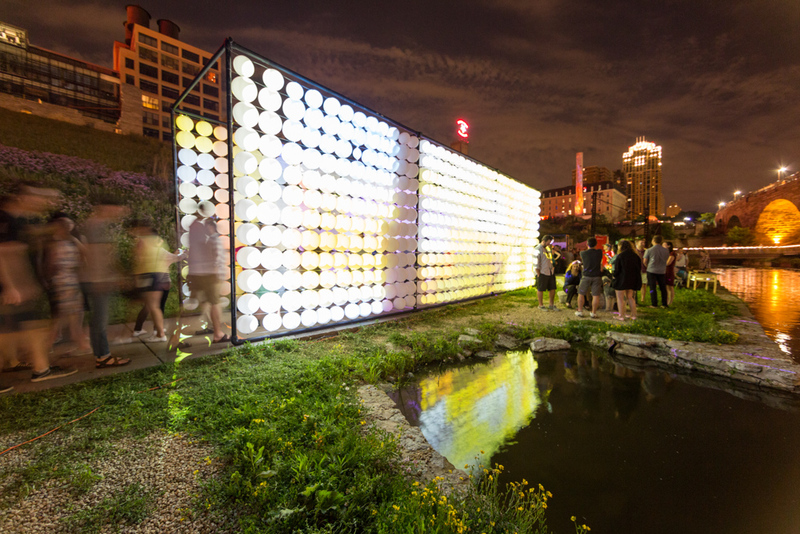 Last year’s projects ranged from coral reefs made from recycled materials to popsicles made from the “polluted water” of a dystopian Minnesota futurescape. There was even a portable soil lab where people could test soil from their backyards for heavy metals. As in past years, there were large projections and epic performances, showing that art can be as spectacular and stunning as it is beautiful. 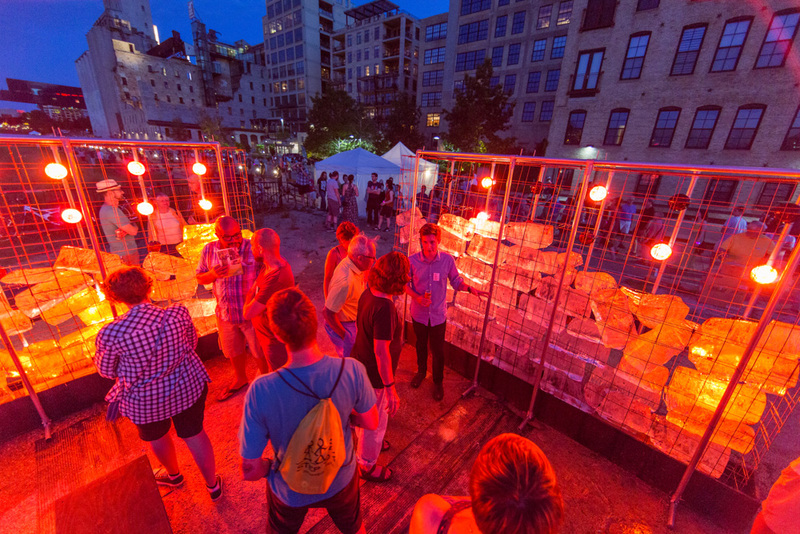 Northern Spark will have a more intimate feel this year, due to its location. 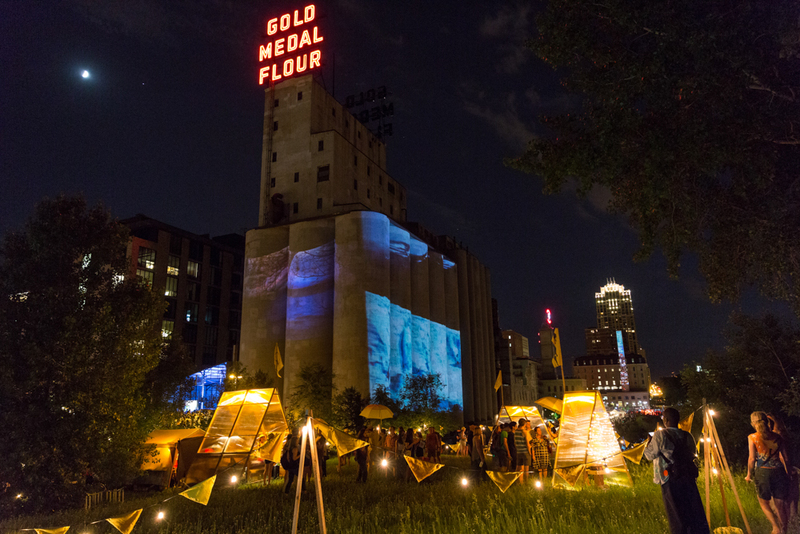 Unlike past years where huge projections, like on the side of the grain silos along the Mississippi River, created a sense of spectacle, this year’s festival takes place in new places like Little Mekong and the Rondo neighborhood, giving visitors a sense of the unique cultural aspects each place. In addition, there will be sites in Lowertown, around the Weisman Art Museum, at the West Bank station, and around U.S. Bank Stadium. This year’s festival will feature nearly 70 projects spread across seven different locations, as opposed to the 35 projects at Mill City last year. The setup is advantageous because “it will be super easy to get on the light rail to get to a different venue,” Dietz says. Free all-night passes for the Light Rail will be available to download and should help alleviate concerns around parking. Northern Spark is partnering with Twin Cities LISC as well as different community development organizations and business associations from each of the neighborhoods. For example, in the Little Mekong area, the Asian Economic Development Association has helped to organize activities in conjunction with their popular “Little Mekong Night Market,” which takes place over two days and features Asian culinary delights, crafts, and cultural activities. Playwright Katie Ka Vang’s interactive performance will take place in the Little Mekong area, which she’s creating in collaboration with textile artist Khamphian Vang and digital artist Christina Vang. Vang says the piece was inspired by a character in a play she wrote in graduate school. “The character was a river that I didn’t understand yet then,” Vang says. 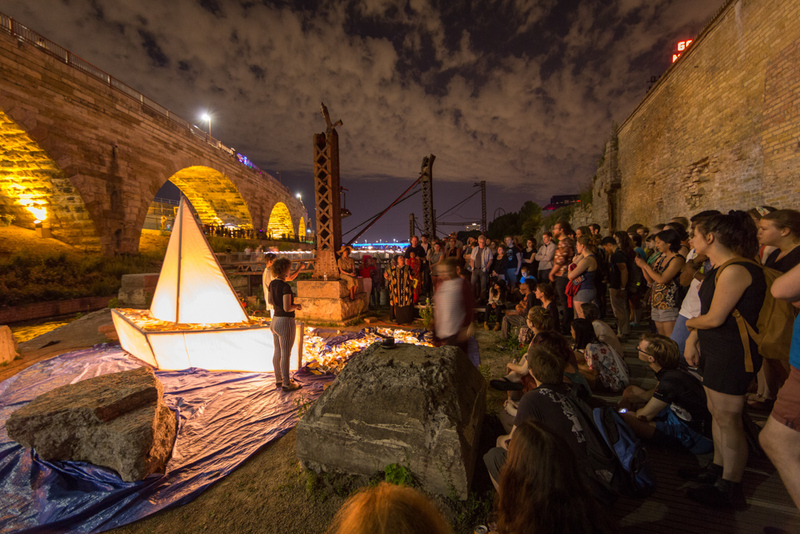 When the opportunity came up to participate in Northern Spark, she decided she wanted to explore her own relationship with water, as a person who has experienced cancer and other serious medical problems. “I’ve had so many medical things where they tell me I need to drink water to flush out everything in my system,” she says. The DAPL pipeline also got her thinking about water as a citizen, and about who has access to water, and who has authority over water. “Do we get a say in how water is being taken care of?” she says. Vang says her piece, which will be a durational performance installation with projections, will include gestures around nurturing, authority, and agency, investigating ways communities take care of and protect bodies of water. The performers will interact with the textile and digital art created by her visual art collaborators. Besides the neighborhood partners, Northern Spark has also partnered with nonprofits that have tackled issues of energy, environmental justice, and climate change. For example, Northern Spark paired Tony Williams, otherwise known as rapper Tony the Scribe, with Neighborhoods Organizing for Change (NOC) on a piece that takes on the issue of air pollution within the Twin Cities. “When they were talking about different environmental issues that they wanted to touch on at Northern Spark and particularly with the racial justice analysis, one of the things that came immediately to mind was thinking about that air pollution,” Williams says. 55411 is among the zip codes with the highest asthma hospitalization rates in the entire state, Williams says, and that’s not an accident. “That’s where people are able to leverage political power against marginalized folks,” he asserts. His piece will feature dancers inside a large glass tank, where they’ll move to a soundscape he put together while the tank slowly fills up with “smog.” As time passes, the dancers will slowly disappear. “I want people to understand that environmental justice isn’t just something that happens in the ozone layer or in Antarctica, but happens in communities around us every day,” Williams says.